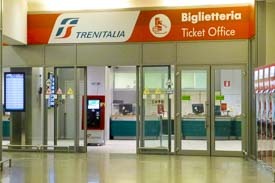 ABOVE: You can buy tickets in the Trenitalia Biglietteria or from easy-to-use, multilingual vending machines (shown below). To reach the trains, enter the station via the main stairs or the wheelchair- and stroller-friendly side entrance (see FAQ: Disabled travelers) and go through the lobby to the doors which lead to the platforms. You'll find ticket counters in the Biglietteria, but if want to avoid standing line, use the automated ticket-vending machines in the station. Electronic signboards and screens show train departure times and tracks. Be sure to validate your ticket at the entrance to the train platform before boarding your train. If you forget, you'll be subject to a large fine. If your train is departing from platform 15 to 23, bear left as you leave the station hall and go throught the passage to the second train shed. Need to use the WC? Read our FAQ: Toilets page. Do you want to eat in the station or buy a snack for the train? See our FAQ: Food and shopping page. Are you arriving by plane and connecting to the station for a train departure? See: Marco Polo Airport to Railroad Station.